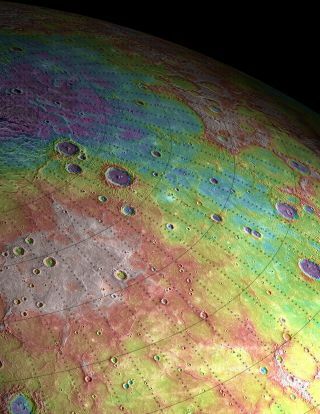 Perspective view of ancient volcanic plains in the northern high latitudes of Mercury revealed by NASA's Messenger spacecraft. Purple colors are low and white is high, spanning a range of about 2.3 km. Width of area spans about 1200 km. Each line is 5 degrees in latitude and longitude. The small, sun-scorched planet Mercury has an interior unlike that of any other rocky planet in our solar system and a surprisingly dynamic history, two new studies suggest. Using observations from NASA's Messenger spacecraft in orbit around Mercury, researchers have found that the planet's huge iron core is even larger than they had thought, and it's likely overlain with a solid shell of iron and sulfur — a layered structure not known to exist on Earth, Venus or Mars. And there's more: Mercury appears to have remained geologically active for a surprisingly large chunk of its evolutionary history, researchers said. "Many scientists expected Mercury, being a small planet only slightly larger than the moon, to have cooled off not long after it formed and to be essentially 'dead' for most of its evolution," said Maria Zuber of the Massachusetts Institute of Technology, lead author of one of the new studies and a co-author on the other. "But it appears that Mercury had an exciting and active middle age." Since then, Messenger has been zipping around the baking-hot planet — which orbits the sun from just 36 million miles (58 million kilometers) away, compared to 93 million miles (150 million km) for Earth — once every 12 hours. The probe is mapping Mercury's surface and gathering data on the planet's composition, magnetic environment and tenuous atmosphere, among other features. To date, Messenger has taken nearly 100,000 images and made more than 4 million measurements of the planet's surface, researchers said. Messenger's original science campaign was designed to last one Earth year, but NASA announced in November that it had granted the spacecraft a one-year mission extension. Messenger officially began its extended mission earlier this week. The two new studies, which both appear in the March 23 issue of the journal Science, detail findings that should help scientists better understand Mercury's murky past. In one study, researchers used observations made by Messenger's laser altimeter to map the topography of Mercury's northern hemisphere. They found that the range of elevations was smaller than that found on either Mars or the moon. Messenger also observed that the floors of many Mercury craters have been tilted substantially. Part of the floor of the Caloris basin — at 960 miles (1,550 km) across one of the largest impact features in the solar system — has even been raised above its rim. These discoveries suggest that internal forces pushed the craters up after the impacts created them, providing strong evidence that Mercury remained geologically active long after its formation. This may surprise many scientists given the planet's small size, Zuber said. "It is not out of the question that Mercury is still active today," she told SPACE.com via email, "though I note that this is not very likely, and for sure we have not observed an active eruption or extrusion." Ancient volcanic plains in the northern high latitudes of Mercury revealed by NASA's Messenger spacecraft. Purple colors are low and white is high, spanning a range of about 1 km. Width of area spans about 250 km. Researchers also estimated Mercury's gravity field by precisely radio-tracking Messenger's movements around the planet. From these estimates, they determined that Mercury has "mascons," large positive gravity anomalies associated with big impact basins (the term is short for "mass concentrations"). "These were first discovered on the moon in 1968 and caused great problems in the Apollo program because they tugged low-orbiting spacecraft around and made navigation difficult," Zuber said. "Subsequently mascons were discovered on Mars, and now we find out that Mercury has them, so they appear to be a common feature of terrestrial planetary bodies." The team's gravity calculations also suggest that Mercury has an iron core that comprises roughly 85 percent of the planet's radius. (For comparison, Earth's iron core covers about half of its radius.) Scientists had suspected the planet's core is big, but many will be surprised that it's so gigantic, Zuber said. Further, it looks like a layer of solid iron sulfide overlies Mercury's core — a feature not known to exist on any other terrestrial planet, researchers said. The new findings should help shed light on Mercury's past, and on the formation and evolution of rocky planets in general. But they also serve to remind scientists that they're in for many more surprises as they continue to probe the solar system's many mysteries, Zuber said. "With new data, we are continually reminded that when you think you know what's going on you probably don't," she added. "Nature is more perplexing than we can possibly conceive."